It’s been almost two years since I wrote my “lens review” on the Projection Optics Company 18″ E.F.. Since then I’ve got several mails and seen some online discussions on it. 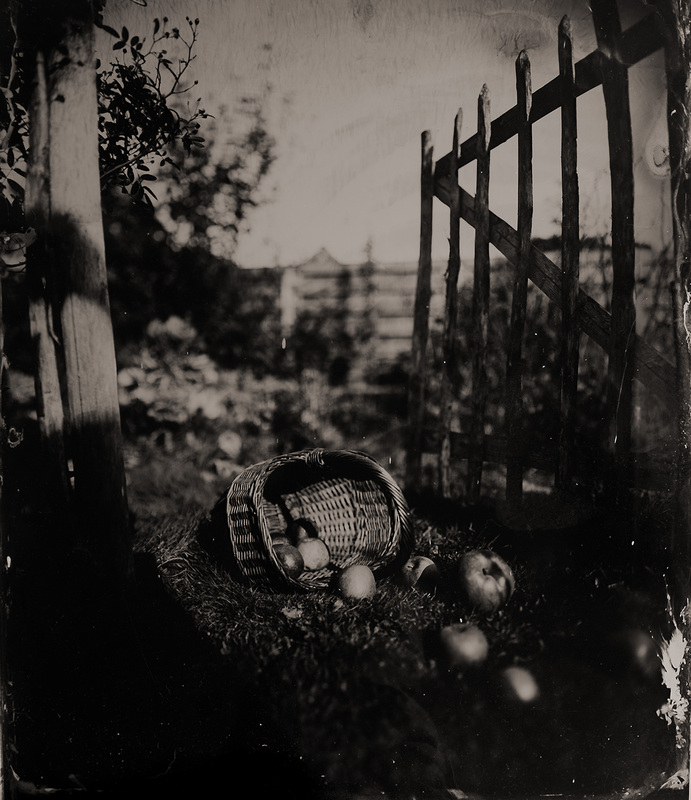 So I thought I’d do a quick update with some additional wide aperture wetplate lens hacks I’ve been playing with. This article will mainly list some technical details (mainly coverage) on the lenses as well as my experience using them. 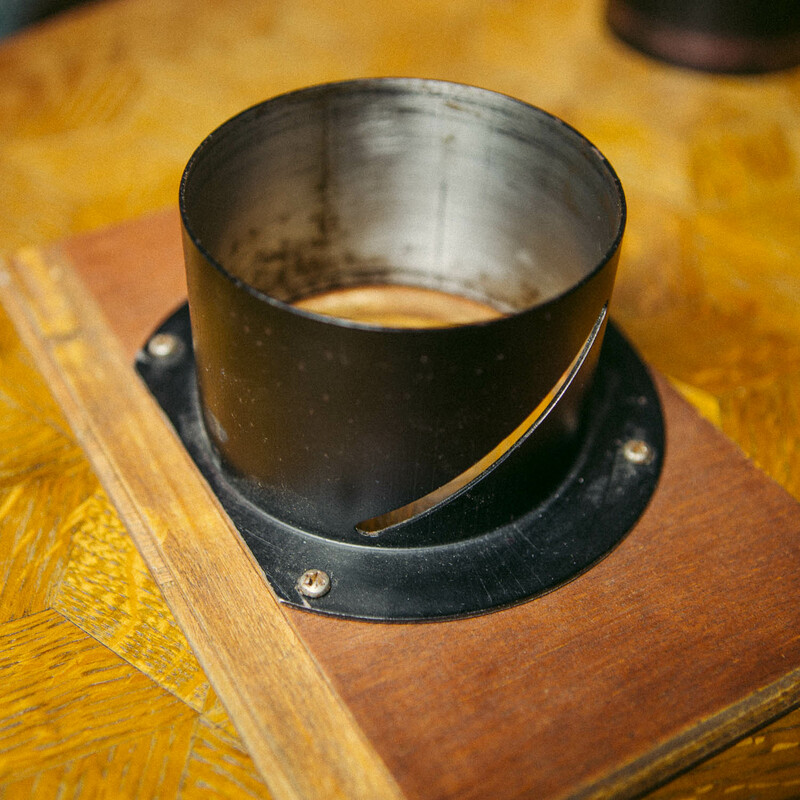 For a more in depth discussion on the trade-offs of using a projection lens for wetplate see my previous post. First off I still use the 18″ lens quite often. It’s just on a smaller camera you want a smaller lens so I started looking around for something more portable. Note that unless stated otherwise all the sample plates in this article are 18 x 24 cm (which is roughly 8×10″). As the name implies this is a fast f/3.5 200mm lens. I found it in a box full of random foto junk on a fleamarket and bought it for 2 euros not expecting much. But any lens for 2 euros is good I guess. The inner barrel with the lenses was mounted in an outer focusing barrel that made me suspect it came from an old 6x6cm slide projector. After removing the lens and testing it on my camera I discovered it fell just short of covering 5×7″ at infinity. The inner barrel protruded behind the last element for around 1cm or something. I carefully removed it with a hacksaw hoping for it to improve coverage, but it had little effect on the coverage. Focused at infinity the image circle is about 10cm. 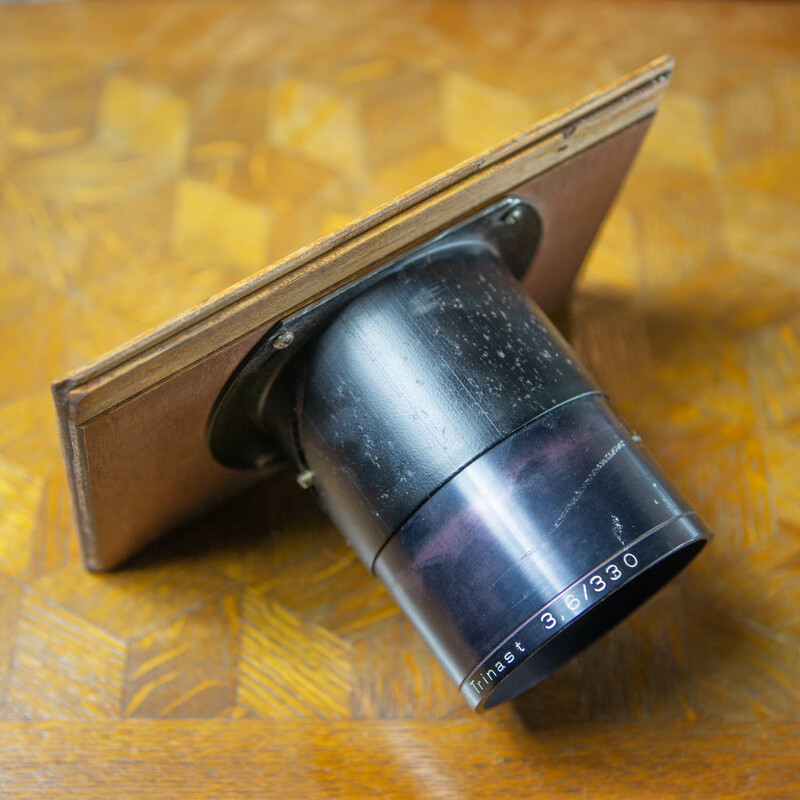 This lens starts to cover 5×7″ at about 1.5m focus focus and just falls short of covering 8×10″ at 60cm. 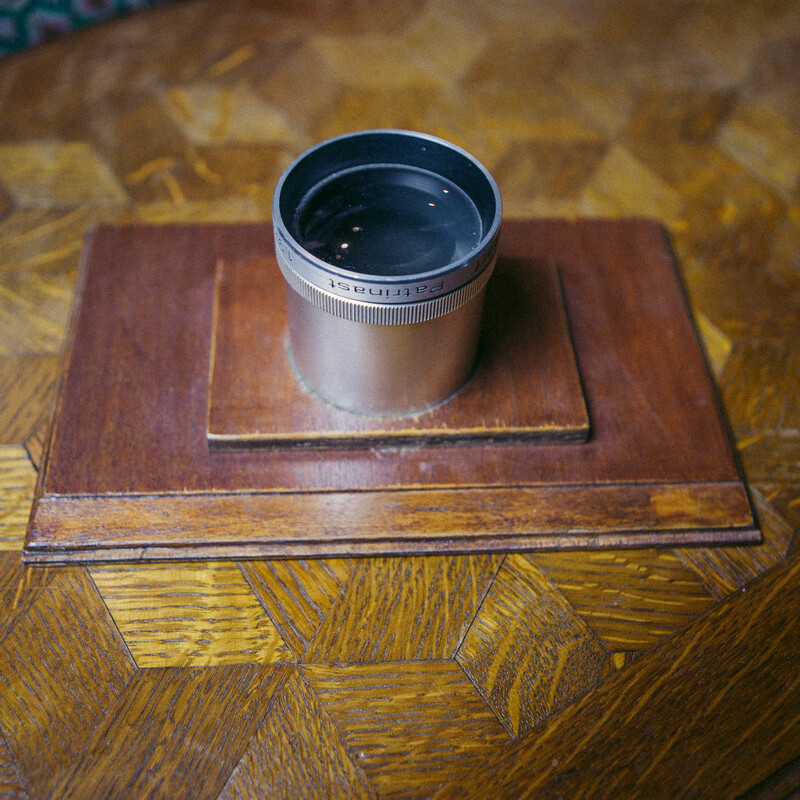 Although it never really covers 8×10″ at portrait usable distances I must admit I really like this lens. It has a certain softness to it and I like the vignette. I’ve used it more than some of the better lenses I have. 🙂 It just gives this really nice “old” look to the images (hmm kindof blurry but in a nice way, very analog). I just friction mounted it in 8mm plywood. 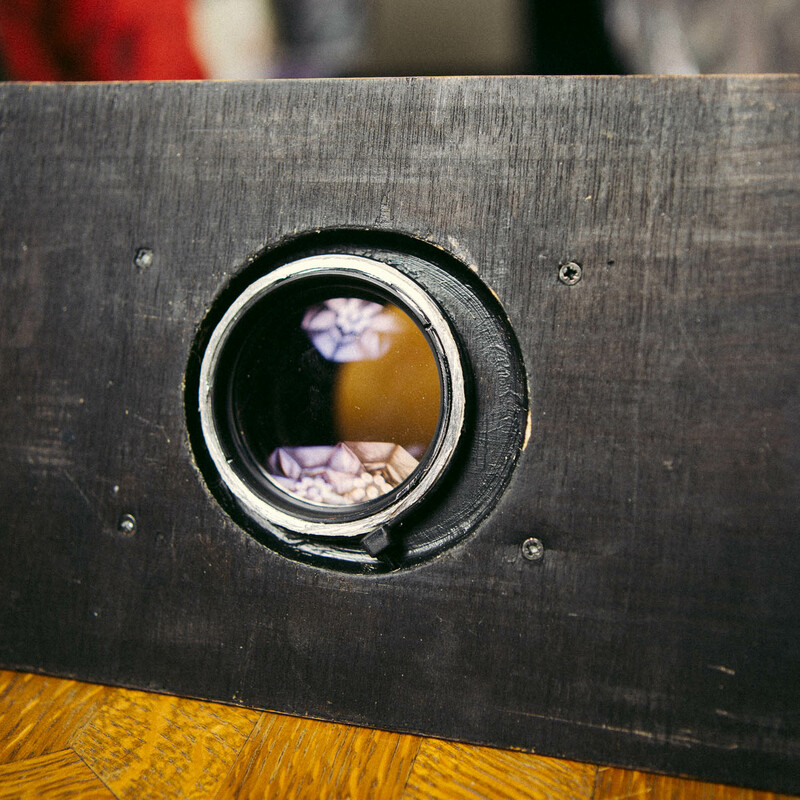 I made a hole that was slightly larger (~1mm on all sides) then glued thin rings of cardboard on the inside using PVA glue until the lens was a very snug fit. I added a ziptie on the inside just to be sure it wouldn’t fall out but this probably isn’t necessary at all, it’s a rather light lens so easy to fix. 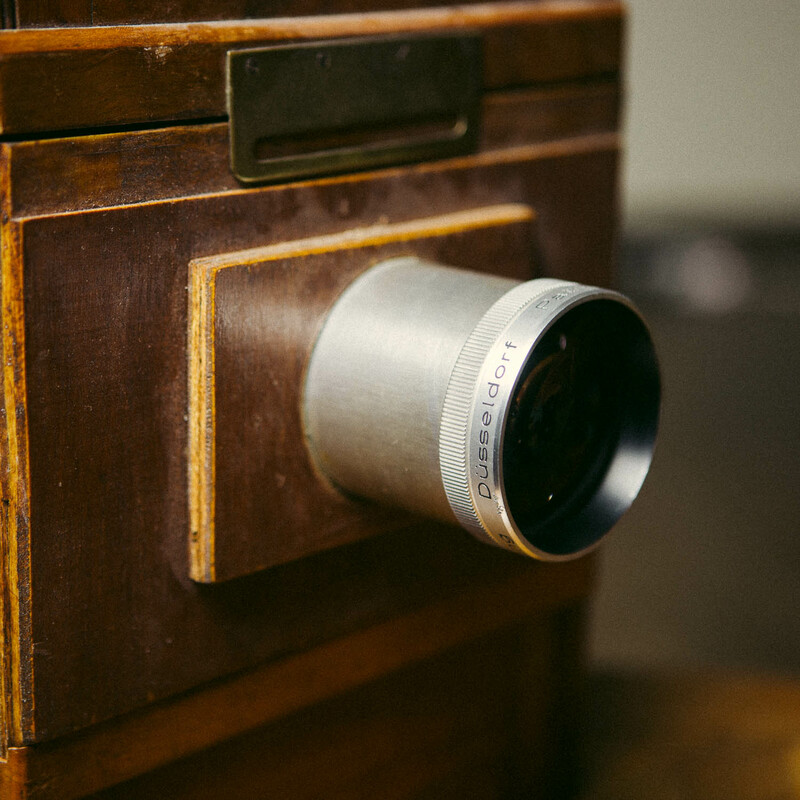 This is not a projector lens but a process lens. At 5,6 it’s relatively fast compared to most common process lenses you find. 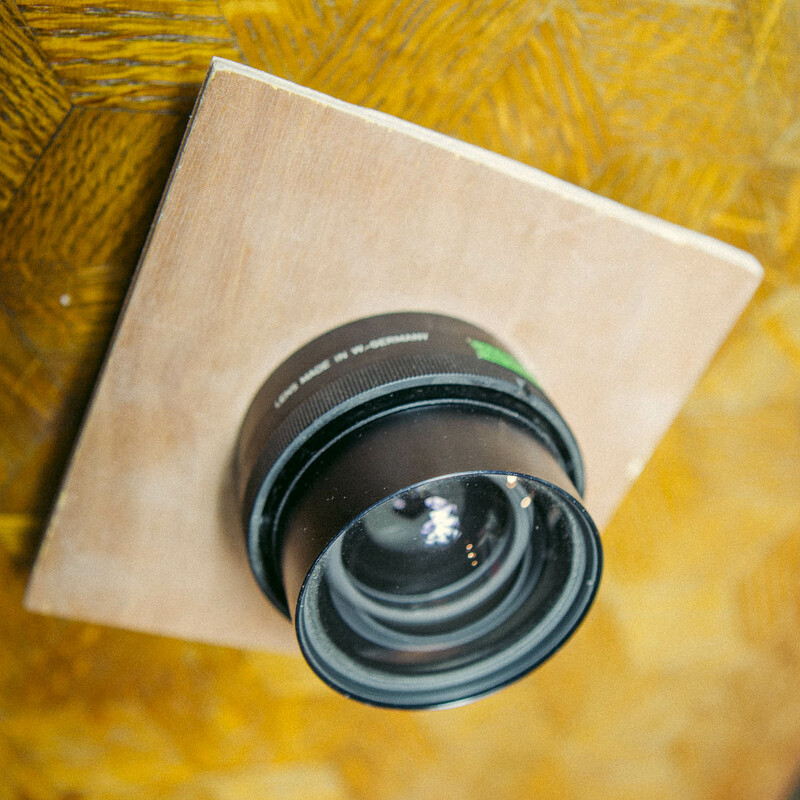 It’s a “proper” lens with aperture selection ring. This one comes from an old printing house repro camera. I bought this from a printing company that was getting rid of old analog material and paid 25 euro for it. Note that process lenses are optimized for use around 1:1 (i.e the image on the plate is the same size as the original) but sharpness is generally better throughout than the projector lenses. This one comfortably covers 8×10″ at all focus distances. Allowing a bit of movements if focused closer. 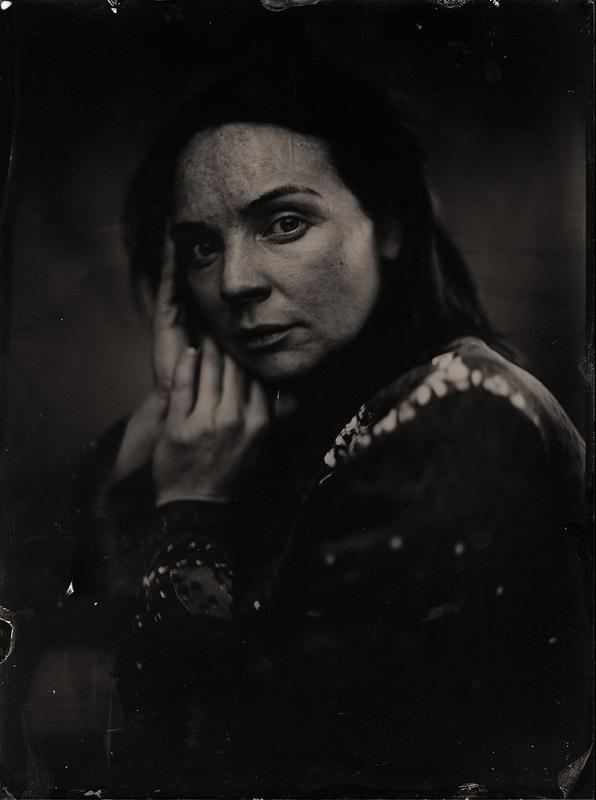 It’s certainly a capable lens for wetplate but it’s look is a bit too “dry”/crisp for my tastes. 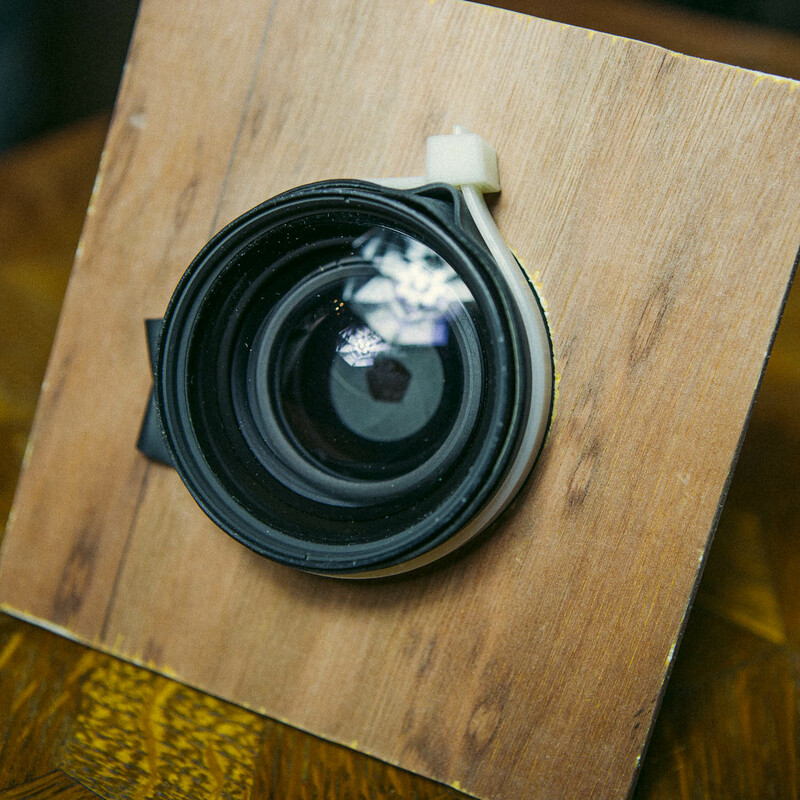 It has a screw fit mounting ring to make it easy to mount to any lensboard. As the lens protrudes around 2cm behind the mounting ring I had to mount it a bit raised so it could fit on the slide-on lensboards for this camera. A f/3.6 lens of 330mm. 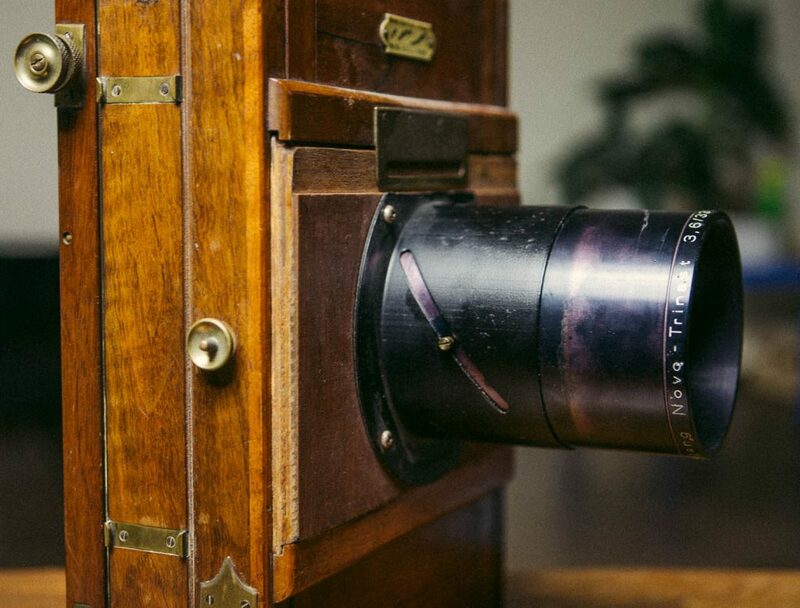 I got this one as part of a fully functioning episcope projector for 25 euro. 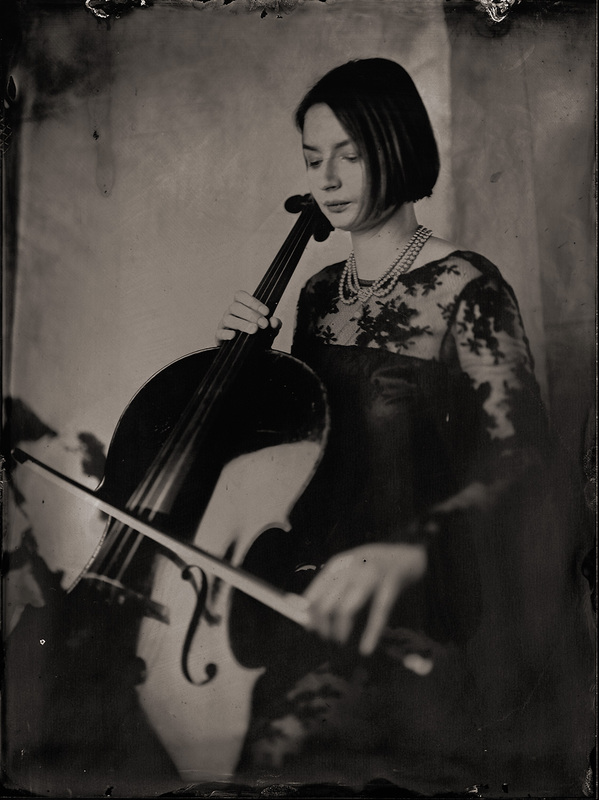 It particularly interested me because f/3.6 at 330mm should be an ideal focal length and aperture for 8×10″ wetplate portraits, wile it being on an epicsope gave me reason to believe it would have adequate coverage. 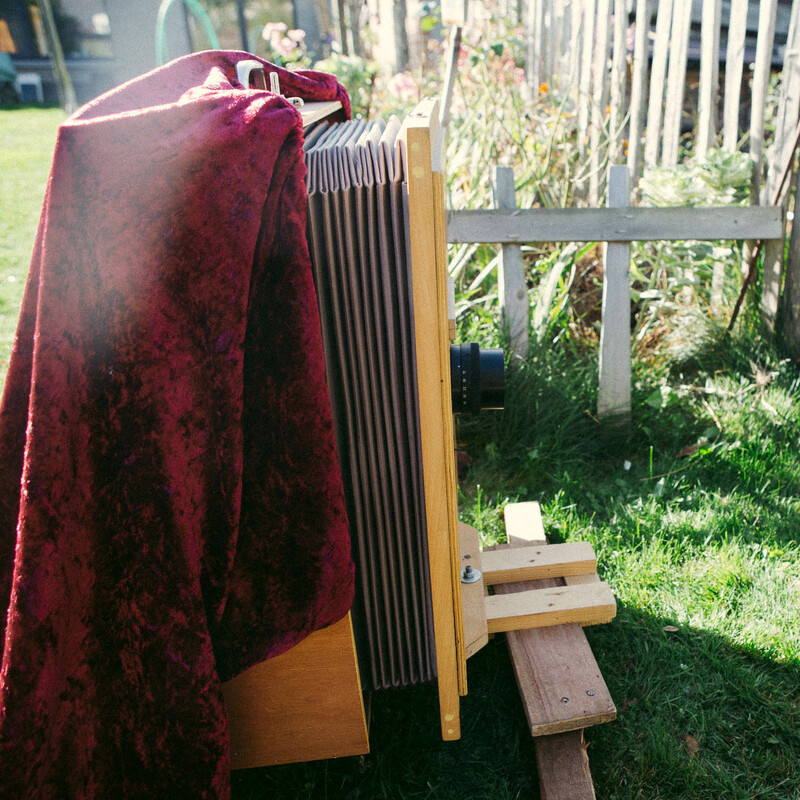 I was not disappointed, it covers 8×10″ and gives me the sharpness I would expect (see my previous article for info on sharpness and projection lenses). Focused at infinity the image circle is around 17cm. Focused at about 100 cm it covers the whole 35 x 45 cm groundglass (although I would use the 18″ for that format). 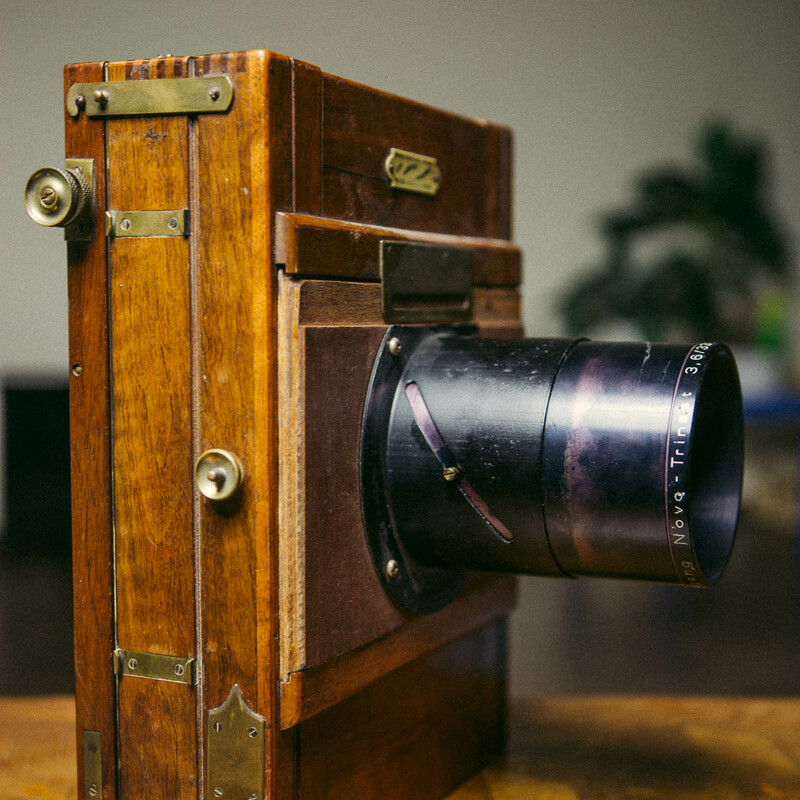 It’s my most commonly used lens for 8×10″ at the moment. It has a similar “old” look to it as the Patrinast. Outdoors it’s a bit to fast, but the old cardboard Waterhouse stop inside the camera trick also works really nice here. Having it with the full projector also gave me a nice barrel-mounting-ring part I could salvage to mount the lens on a lens board. Sadly enough I didn’t take a picture of the full projector before taking it to the scrapyard. Just search “Liesegang Episkop E8” if you’re interested. 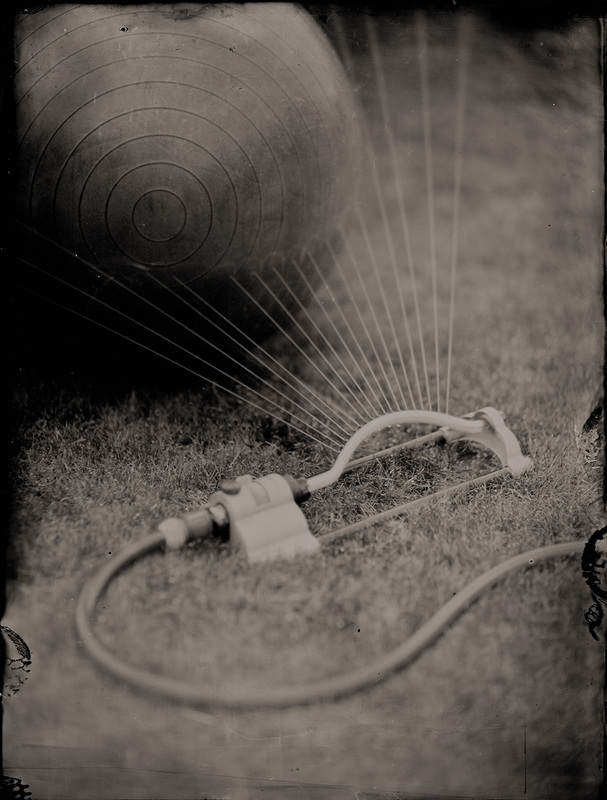 Finally note that the garden hose sample plate below was taken using an f/8 cardboard Waterhouse stop. Another process lens. A bit bit of an outsider here as it’s rather slow but I just wanted to document this since I found little info about it online. I bought this for 20 eur (from he same joint as the Rodagon) not really knowing what it was. However, if you’ve seen a lot of projector and repro lenses you’ll immediately notice something strange about this lens. For a ~200mm lens of f/9 or so it’s rather heavy and large. People naively measuring the front lens diameter to determine the aperture would probably think they have a f/3.5 lens (you really have to start measuring the entrance pupil if you haven’t yet). Even then, it’s a lot heavier than the “Patrinast” described above. There just seems to be a lot more glass in this one. All that for a meager f/9.25? Online research once at home turned up it was optimized for large image circles. For all this glass, I had some expectations of huuuge image circles but it was disappointed it just clips of the corners of a 11×14″ plate focused at infinity. It’s image circle is certainly larger than the other two ~200mm lenses above but still it seems to come at a large expense for the lens maker. There is a trick to get it to almost (but not quite) cover a full 11×14″ plate at infinity: You stop it down to f/45 and then pull the focus nearer. 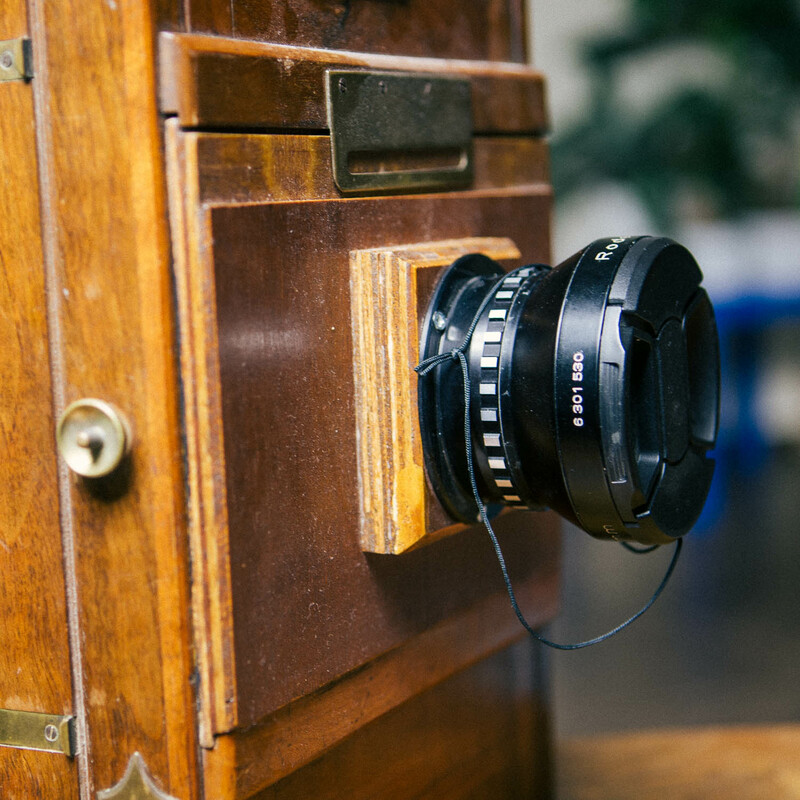 Due to the high depth of field at f/45, infinity will still be in focus when the plate gets almost fully covered. Not sure how to call this, the hyper-focal image circle trick or something. Focusing on anything closer than 150cm will cover 11×14″ at f/9,25. Note that focused at this distance on a 210mm on 11×14″ is still a peculiar look. If focused on a person, the person will appear relatively small in the wide angle image (this thing has ~94 degrees field of view). 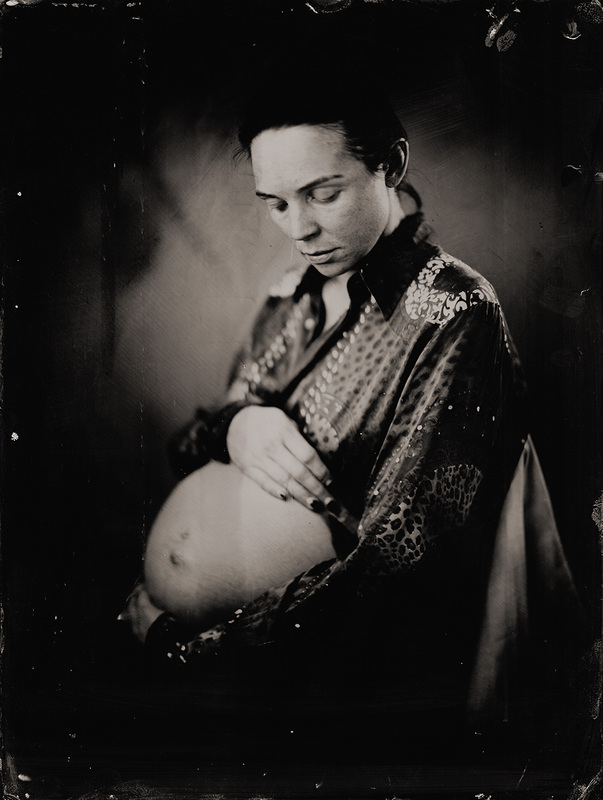 I’ve only shot one plate with it posted below (note this plate is 35x42cm (14×16″)). There’s a 2 stop GND filter on it as well to balance out the sky a bit. It’s still a peculiar look on the camera the bellows extension is really shot for this format. It’s an ok lens but it’s use is just a bit too niche. Maybe nice if you want large plates with short bellows or other special purpose uses. This one has a threaded rear barrel so you can screw mount it but I don’t have the correct mounting ring. So I just made a hole large enough for the rear end and butted the wider front end to the lensboard. Then fixed it on the inside with an old bicycle tire and ziptie (as long as it works heh!? ).